Sorry for the large gap in posts. This time of year gets crammed with routine doc appointments, seasonal parties and guest visits. And since I’m doing 100% of the driving right now, that means more time at fun things like grocery shopping. I’m driving Miss Nancy! That plus the perfect weather has the garden going crazy with new growth – take away the hot weather bugs and the plants take off big time. This season I’m trying to do the best I can to space plantings (in time) for a more continuous harvest. It’s working out just right but for sure it takes more attention. Both grandsons are home for the holidays and we managed to capture them for two days. That’s two grandson’s and Simon’s menagerie – River, a dog, and Tony, a turtle. We squeezed in some fishing and Nancy pulled out the stops on feeding them so it was a fun time. Chris had emailed a recipe for meat balls that he claimed to be best ever so we tried those out on the boys. Success – they were incredible. I’ve always been of the “all meatballs are the same” school of thought. Now I’m a convert. The pasta sauce that she made with the meatballs was also exceptional – made from Cherry Tomatoes. You know you have a serious overload of cherry tomatoes when you can make a gallon or so of sauce. And while I’m on cherry tomatoes. another cherry tomato pizza this time with New Zealand spinach and Cubanelle peppers as extra toppers. Incredible and we’re probably the first people in the universe to have that combination. I’m using the NZ spinach in green smoothies, mixed with lettuce in salads, and anywhere else that seems reasonable. The interesting thing is that the more we use it, the better it gets. The first time I cut it the leaves were older and tougher – edible but not optimum. With each cutting, the number of old leaves and stems is being reduced so that now the entire patch is mostly tender. The patch is roughly 6’x2’ and I guarantee you that’s big enough to supply us and half a dozen more friends and neighbors. And now the row of kale is at full production level – a 3’x10’ row will keep everybody we know in Kale overload from now until April. Ditto leaf lettuce, collard greens, and Swiss Chard. These are all crops that continue producing new leaves as you pick. We know a few vegans so it’s time to invite some over for a major garden trim job. Then there are the unitary crops – cabbage, broccoli, cauliflower, beets, carrots, onions, garlic, radishes. potatoes – one plant, one harvest. These are the ones that I try to spread out so that there’s always something ready to pick. Even then, with just the two of us each cabbage or each broccoli or cauliflower ends up covering our needs for two or three meals. You do the math. We had a nice day yesterday with Tom. His company has moved to a new location downtown and we were invited down to see the new place. We took the sun rail train instead of driving – avoiding the Interstate construction and downtown parking issues. It’s about an hour train ride vs a 40 minute drive if the Interstate doesn’t jam. And even with cheap gas prices, it cost us $7.50 for two round trip tickets so it made sense in every way. Tom met us at the Church Street Station which is about a 5 minute walk to his building. They occupy several thousand square feet on the 19th floor of the Chase building. Beautiful views all around – it overlooks lake Eola, an Orlando central landmark- and you can see the control towers at the airport – probably 15 miles away. It was a complete gutting and rebuild of the facility except for the reception area. I was more than a little impressed with how well it turned out both functionally and aesthetically. Great lighting, great sound control and plenty of space for growth. The garden is starting to produce at a good clip. 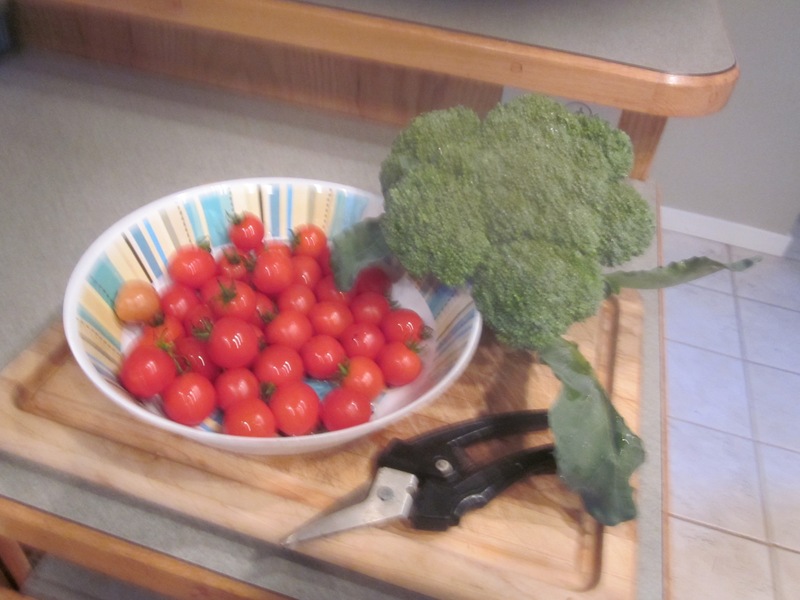 Lot’s of cherry tomatoes – enough to make a cherry tomato pizza every day if we wanted; all the lettuce we can eat; ditto radishes; kale and New Zealand spinach leaves for green smoothies; could pick a head of broccoli and a cabbage. The swiss chard is just too buggy to eat so I’m pulling it out and starting a new batch. By the end of this month we should be rolling in spinach and I put in a new row of turnips. My guess is that these turnips will produce only greens but now I know why, thanks to my Florida Gardening library book. Turns out that you should never disturb any root crops. You thin them but leave the remaining plants exactly where they are. When I thin, I do it very gently and then replant the one’s I’ve dug out. In the case of the turnips, I planted one row thickly and then made 3 widely spaced rows when I thinned. Basically all of the little plants were moved. That’s why my carrots are inconsistent too. Live and learn. That same book also had a section on pineapples. I have a row of 7 in the garden that I’m going to yank out based on the book. I had planned to put a photo of some recent garden goodies but a recent software update left me scratching my head as to how to load a photo from the camera memory to the computer. It was always almost automatic, now they’ve managed to make it much more difficult. I hate the words “update”. Another first – one of Nancy’s buddies brought her a couple garlic heads so I broke one down into 9 cloves and planted those as an experiment – 3 rows with 3 each separated 9”. Within a week, 3 popped out and as luck would have it, those 3 were all in one row. Then nothing for a week so I assumed that only 3 out of the 9 were going to germinate. Another week brings us up to today. I did my morning garden check and saw that another 3 had popped out overnight and those 3 were all in the same row so I now have 2 rows of 3 each out and growing and another row of 3 still underground. Seems like a strange pattern to me but………….. I think these are a 4 month project but they don’t take up much space. I also learned that there are two different kinds of garlic designated hard neck and soft neck. Here we’re supposed to be growing soft necks but I have no idea what I’ve actually planted. Another fixit job nailed (or not?). I think I mentioned that the mower was in the shop. No complaints – it’s about 10 years old and never failed to start on the first pull. It needed a carburetor, replaced or cleaned, and a coil. They charged $75 which I thought was reasonable. On it’s first run since getting it back it ran perfectly but I noticed that it was really taking a lot of effort to do the job. It’s self propelled but really didn’t seem to be. I had noticed that before but attributed it to a loss of power that would be fixed along with the tuneup. Nope, lots of power to cut grass but nothing to drive the wheels. I took the wheels off to see if maybe that area had become clogged and immediately noticed that the gears on the wheels were totally stripped, worn down. I went online and found the replacement wheels – how tough could it be to change tires? In the nothing is ever easy column, I found the replacements and ordered a set in a matter of minutes. They arrived about 4 days later. I unpacked the shipping box and found there were two different wheels – the correct one and another that lacked the internal gearing necessary to self propel the mower. Interestingly both were labeled with the same SKU # although clearly they were two different parts. It took about 20 minutes to get the error corrected and a replacement part on the way but I had to send the discrepant part back. That means at least a week before I get to mow again – assuming the new parts work and I can install them correctly – so that’s not too bad. Update – Got the replacement part and the new wheels were installed within the next 5 minutes. Works like a world champ. And to continue my “fix-it” streak, I successfully glued the rear view mirror back on the truck. I’ve done this a few times before but it’s never lasted thru a summer – just too hot inside the truck I guess. This time I used a Gorilla gel glue but I won’t know for sure how long lasting the fix will last until it makes a summer. Old dog, new tricks. I take Nancy to her quilt meeting every Tuesday then go to the library to kill a couple of hours. This time I went to the gardening section and picked up a book on vegetable gardening in Florida. I wanted to be sure I knew everything there is to know and check to make sure the author was a good gardener. I actually picked up three useful bits of info (so far). One, there are indeed turnip varieties grown specifically for the tuber and others that are grown for greens. Two, never cover carrot seeds with dirt. When you water lightly, enough dirt will splash onto the tiny, tiny seeds to get the job done. I always covered mine. And three, as potato plants grow (above ground) you should mound dirt around the plant so that only the top few branches are out. Apparently the potatoes will form in the built up area and you’ll get way more potatoes from each bush. I’ve never done that – until now. It may be too late since the plants are fairly tall but I’ll give it a try anyway. Simon stopped by on his way back to Alabama and spent the night. We managed to catch a few fish and were able to fit the float boat into his car so he’ll now have a fishing craft at home. It disassembled much easier than I thought after sitting outside in the jungle for over a year. My concern was that it would have rusted together and been forever in the assembled mode. He lives close to a first class river and the float boat should be just perfect. He’s looking at a 20 mile stretch where he can launch at one end and have a buddy with a pickup truck meet him downstream later. Knowing Simon, if there are clear beaches along the way, it’ll turn into a multi day camping trip.